Mizuma Art Gallery is pleased to present Fey, a solo exhibition by MAJIMA Naoko starting from April 11, 2012. Majima Naoko was born in 1944 in Aichi prefecture and graduated fromt the Tokyo University of the Arts with a degree in oil painting in 1968. After making her solo show debut in 1986, she has been continuously creating ominous yet beautiful pencil drawings and objects in her very own style. Whilst showing many of her works in museums and galleries all over Japan, she has also been active abroad, exhibiting in France, Indonesia or Bengladesh, where she was awarded the Grand Prix of the 10th Asian Art Biennale in 2001. In 1959, Majima was just 15 when the Isewan Typhoon hit Japan and caused massive destruction. Despite the intensity of this “primitive scenery” filled with death, drawing from her experience of survival, Majima’s work is overflowing with vitality. In her past works, “cells” tirelessly repeat mitosis on the paper surface, growing into clusters, breeding and fighting over their expansion toward every corner. However, Nature struck again and brought a new change to the style Majima had been cultivating for years. Last year’s triple disaster put a halt to Majima’s creation, but when she took her pencil again, the “cells”, as if awakened to consciousness, organize to build skeleton-like structures, starting to shape stories. Already dead at the very instant of their birth, the “Fey” bear on their heads substantiated emotions and memories. From the boundary of oblivion, they seem to silently communicate us the magnificent power of the relentless spriral of “life” and “death”. Furthermore, the substantiated “Fey” penetrate the exhibition space. 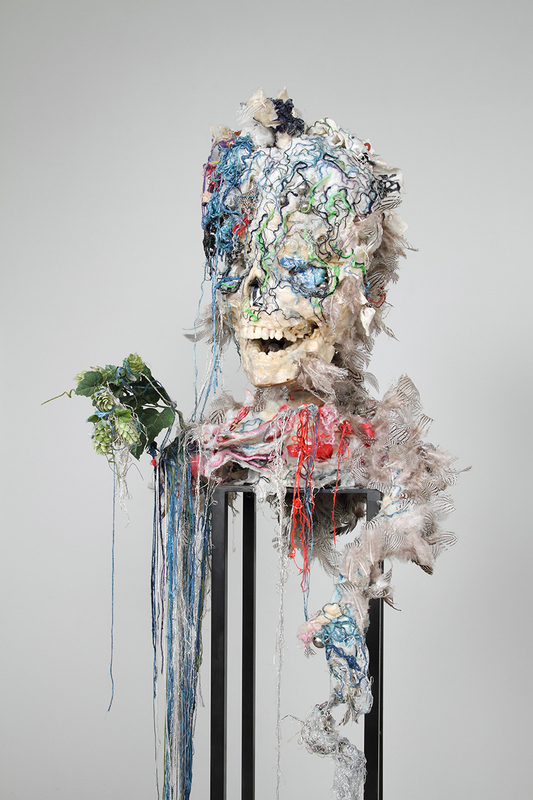 Accretions of various colorful pieces of fabric, feathers and plastic scrap that she collects on a daily basis, Majima has created new sculptures for this show. Those dreadful yet exquisite figures convey the viewer to a danse macabre. The exhibition is with no doubt an important milestone for Majima who has created continuously created works filled with surprising evolutions, responding to the sudden changes in their environment, like living creatures. We invite you to experience the very creative energy that underlies life itself.